Stakeholders who want to weigh in on the potential impacts of the Pebble mine project will have two more months to do so. The U.S. Army Corps of Engineers Alaska District announced Friday morning that it will be extending the public scoping period to 90 days from the statutory minimum of 30 days for the project’s environmental impact statement, or EIS. The Pebble EIS scoping period, which began April 1, will now run until June 29 instead of the original April 30 closing date. Scoping, as the name implies, is when the public and cooperating government agencies are asked to submit the scope of potential environmental and socioeconomic impacts that should be studied in a proposed development’s EIS. The Corps of Engineers has also had an invitation out to 35 recognized Tribes for government-to-government consultation during the Pebble EIS process since Jan. 12, according to a March 30 press release. The extension comes after repeated calls for such an action from not only opponents to the project but also Sen. Lisa Murkowski and Gov. Bill Walker’s administration. Murkowski also emphasized that she remains neutral on Pebble, but she strongly objected to the Environmental Protection Agency’s move in 2014 to preemptively stop the project. Walker has repeatedly stated he is against the Pebble project, going back to his 2014 campaign for governor. When Pebble Limited Partnership unveiled its scaled-down mine plan in October Walker stopped short of wholly denouncing the plan, but said in an interview with Alaska Public Media that the company still has a exceedingly high burden to clear and he is very skeptical it can be developed responsibly. Murkowski additionally asked Corps officials to hold more scoping meetings in communities in the Nushagak River drainage where the mine would be located. The Corps originally scheduled one scoping meeting in Dillingham April 17, which is the regional hub community at the mouth of the Nushagak about 100 miles southwest of the mine site. However, a public meeting in New Stuyahok, a village along the middle reaches of the Nushagak, was recently added for April 13, according to the Corps’ website for the project. The other meetings are in communities near the project’s other proposed facilities — the gas pipeline, a deepwater port, an Iliamna Lake ferry and associated roads. Murkowski also asked that Alaska Native corporations be consulted on the project. Bristol Bay Native Corp., which is the regional Native corporation for the area, has long been an ardent opponent of Pebble. Department of Natural Resources Commissioner Andy Mack sent a similar letter to Corps Alaska leaders March 28 asking for 90 to 120 days of scoping for the Pebble EIS. Heatwole downplayed the importance of the public input period when the 30-day scoping plan was released. He suggested the public comment period following the release of the draft EIS is far more important, as it is when the public can critique the work the Corps’ has done evaluating the project and suggest changes for the final draft. When the Corps released its initial two-year schedule to reach a record of decision on the Pebble EIS with a 30-day scoping period March 20, it immediately drew sharp criticism from groups fighting the project. While the EIS schedule and drafting for each project is different because no two developments are the same, they noted the Corps has regularly taken upwards of five years to complete the EIS process on other large projects in the state; some with scoping periods in excess of 100 days. Shane McCoy, the Pebble Project Manager for the Corps, said in an interview after the Pebble timeline was released that it is a “straw man schedule” and stressed that the agency understands the strong emotions that surround the project. The Corps has taken more than five years to reach a final EIS on the Donlin Gold mine project, which is roughly similar to Pebble’s plans. Donlin Gold is an open-pit mine project in the Kuskokwim River drainage north of the Pebble deposits in Western Alaska. 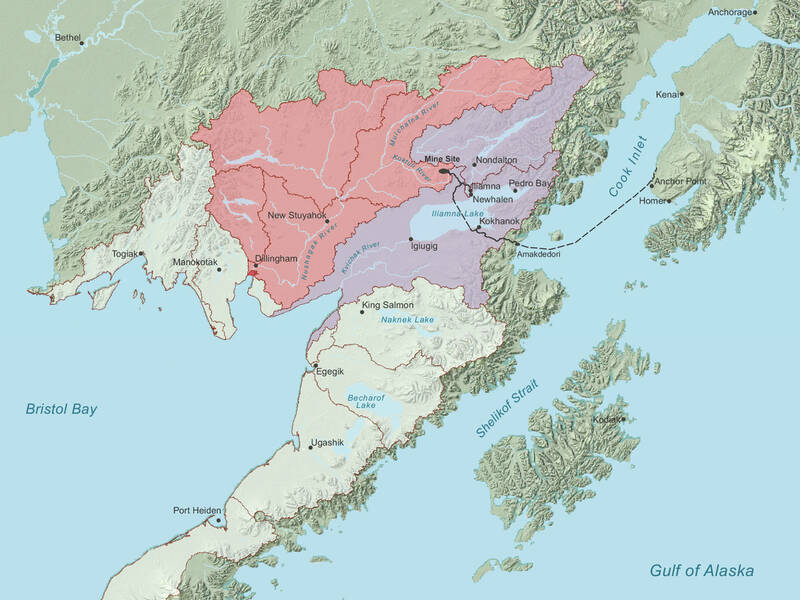 Both projects, as proposed, call for large surface mines in the upper reaches of large salmon-bearing watersheds with commercial and subsistence fisheries, as well as natural gas pipelines from Cook Inlet to power the operations. Mack noted in his letter that the Donlin scoping period lasted 105 days with 14 public meetings — at a rate of about one per week — and wrote that the state requests a similar process for Pebble. There are nine public meetings currently scheduled over 11 days in mid-April during Pebble’s scoping period. Donlin Gold applied to initiate an EIS in December 2012 and a final EIS is expected soon, according to the Corps’ schedule for the project.